Andy's Forum > Categories > ALTERNATIVE HEALTH > Could your gluten intolerance be the result of a mineral deficiency? If you are one of the millions of Americans who suffers from either gluten intolerance or gluten sensitivity, it may be that you are actually deficient in certain trace minerals rather than allergic to wheat. 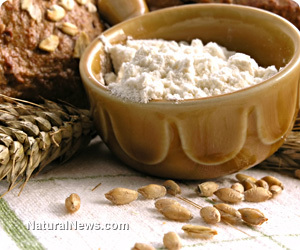 A growing number of doctors with an understanding of the fact that many of today's foods are lacking in vital nutrients are discovering that their gluten-averting patients experience dramatic health improvements when they get their mineral levels back up to par. One such mineral for which a majority of Americans is likely deficient is zinc. Holistic Nutrition Therapist, Clinical Herbalist and Healing Foods Chef Katie Bauer, M.A., C.N.E., C.H., explains in a recent blog posting how many people with gluten intolerance and Celiac disease suffer from severe malabsorption, which means they are not absorbing enough nutrients. Many Americans, she points out, already consume less than 10 milligrams per day of zinc, which is less than the amount required for good health -- and those with gluten issues are absorbing even less. Gluten is commonly believed to harm the ability of the small intestine to absorb nutrients like zinc, which in turn leads to deficiency. This may be the case for some, but it may also be the case that people with gluten intolerance are not consuming enough zinc, which could be exacerbating or even directly causing gluten intolerance symptoms. Zinc, after all, is critical for the proper function of more than 100 enzymes in the body, including those that regulate digestion. "Zinc supports a healthy immune system, is needed for wound healing, and is involved in energy metabolism, hemoglobin production, carbon dioxide transport, prostaglandin function, synthesis of collagen, protein synthesis, and vitamin A metabolism," writes Bauer. "Zinc is important for male fertility and supports normal growth and development during pregnancy, childhood, and adolescence." Zinc has also been scientifically shown to be a powerful healing agent for damaged mucosal lining, a thin membrane that protects the body from contamination during digesting. Many people with gluten issues suffer from a damaged digestive tract, for which supplementation with the synergistic nutrient blend zinc and l-carnosine could provide lasting improvement and even healing. Another common mineral deficiency that may play a role in gluten intolerance and sensitivity is magnesium. You may already be aware that magnesium is essential for healthy bones and the proper absorption and use of vitamin D by the body. But did you know that this essential mineral is also crucial for the health of muscles, the nervous system, the heart and the metabolic system? According to Dr. Craig A. Maxwell, an acclaimed integrative and osteopathic physician based out of Ohio, a whole host of seemingly diverse illness symptoms may actually be the varied consequences of a magnesium deficiency. While neither Bauer nor Dr. Maxwell suggest that gluten sensitivity is directly caused by a magnesium deficiency, the link between the condition and the deficiency appears to go both ways. While it is definitely the case that many people with gluten issues actually are allergic to wheat, which in turn causes their bodies to absorb fewer minerals on top of an already mineral-deficient diet, it may be the case for others that a mineral deficiency is the actual cause of gluten sensitivity. It is thus important to consult with your doctor or naturopath, or perhaps speak with a nutritionist, about getting tested for mineral deficiency. From there, you can work on getting your levels balanced and seeing whether or not this helps address your gluten issues.